Toxic gases are classified as dangerous goods (class 2.3) and though each mode of transport, (air, sea, road, rail and inland waterway) has its own regulations regarding their use and transportation, they are now largely harmonized with the Model Regulations, published by United Nations Economic and Social Council’s Committee of Experts on the Transport of Dangerous Goods. 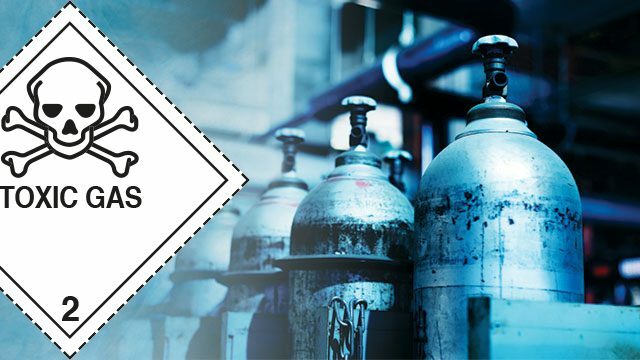 An important part of ensuring the safe transportation, and end use, of toxic gases is their correct labelling and marking through the Class 2.3 toxic Gas label and placard. Toxic gases are mostly carried under pressure to reduce their volume and save space in transport and storage. Commonly transported class 2.3 gases include: Chlorine, Phosgene, Arsine, Diborane, Hydrogen Selenide, Nitric Oxide, Nitrogen Dioxide, and Phosphine. 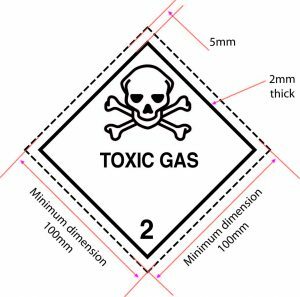 The Class 2.3, toxic gas label for packages must be at least 100 x 100mm, from edge to edge, and it must show a dotted outer boundary line (unless being applied on a background of contrasting colour). The class number ‘2’ must be shown in the bottom corner and be in text at least 12mm high. Additional text saying ‘Flammable Gas’/’Non-Flammable, Non-Toxic Gas’/’Toxic Gas’ may be shown in the bottom half of the label, but this is not mandatory. There must be a gap of 5mm between the inner black border and the outer dotted border or the outer edge of the label. The upper half of the label must contain the relevant symbol. The line, flame symbol/gas cylinder symbol and text on class 2.1 and 2.2 labels can either be all black, or all white. All Class 2 toxic gas labels and placards manufactured by Hibiscus Plc, comply with IATA/ ICAO, UN ADR/RID and IMDG/IMO requirements, and are made from materials that meet the strict BS5609 standard. BS5609 is a specification for labels that are intended for marine use, whereby both the ink and the substrate must be able to withstand 3 months continuous immersion in sea water and still be legible and have good adhesion. 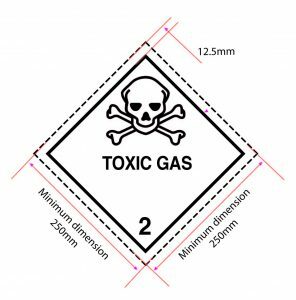 We manufacture the toxic gas label at 101 x 101mm on rolls of 250, and as single cut labels at 100x100mm. Class 2 placards, for use in international transportation, are supplied at 250x250mm and 200x200mm for UK transport only.